30/10. The impact of whole exome sequencing (WES) on clinical management of patients with neurodevelopmental disorders can increasingly be felt, and overall numbers are emerging, which document the success and impact of this technology on clinical decision making. In 30% of patients with neurodevelopmental disorders, a diagnosis can be obtained through WES, and in 10% of patients, this diagnosis significantly alters patient management. A recent publication in Annals of Neurology investigates whether this concept extends beyond the epileptic encephalopathies and also includes patients with presumed cerebral palsy, cerebellar abnormalities, and hypomyelination. Team effort. The current publication by Srivastava and collaborators summarizes the experience of the Pediatric Neurogenetics Clinic at the Kennedy Krieger Institute with exome sequencing in 78 patients with unexplained neurodevelopmental disorders. The methods part of this publication outlines nicely how exome analysis has become a team effort of three child neurologists, a biochemical geneticist, and three genetic counselors. It is fair to say that in 2014, you will need such a team to translate genetic data from next generation sequencing into clinical management. The broader phenotype. The study by Srivastava and collaborators included 78 patients with neurodevelopmental disorders presenting to their neurogenetics clinic. The patients had a broad spectrum of neurological presentations, including cerebral palsy-like encephalopathy, autism spectrum disorder, intellectual disability, myelination changes, and cerebellar findings. Applying whole exome sequencing through in house pipelines or various commercial providers, the authors were able to identify an underlying cause in 41% of patients. Let’s review a few non-epilepsy examples of what the authors found in their patients. 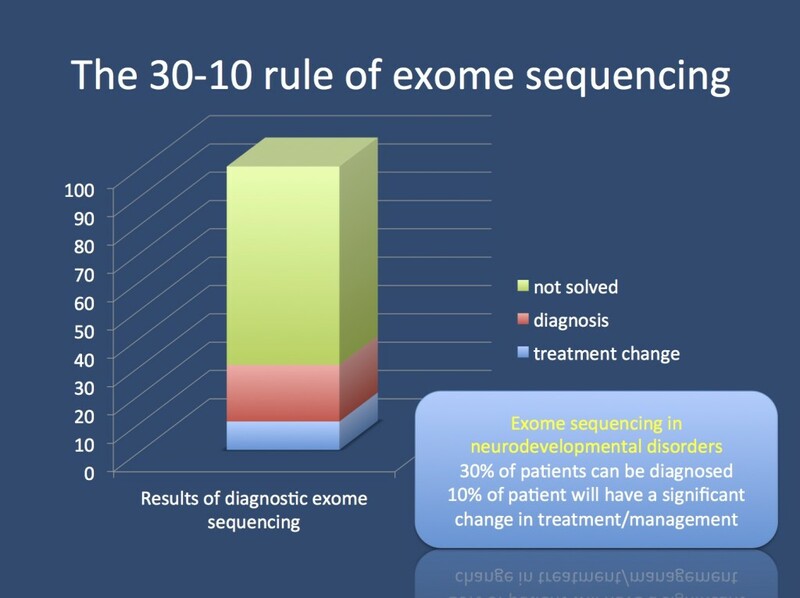 The 30-10 rule of exome sequencing. Exome sequencing is likely to discover the cause in patients with presumed genetic neurodevelopmental disorders in ~30%. In ~10% of patients, this new diagnosis is likely to alter patient management. ADCK3. In a patient with regression and cerebellar atrophy starting at the age of 11, the authors identified a compound heterozygous mutation in ADCK3, the gene for primary coenzyme Q deficiency type 4. The ADCK3 gene codes of the human orthologue of the yeast coq8 gene, and the gene product has been shown to be involved in ubiquinone synthesis. Defects in this protein result in impairment of the respiratory chain. This neurodegenerative disease usually presents as childhood-onset ataxia, seizures, and elevated lactate. The patient described by Srivastava and collaborators had cerebellar atrophy and did not have additional clinical features. It should be noted, though, that even though the disease is referred to as coenzyme Q deficiency, unfortunately, there is little evidence that supplementation with coenzyme Q is beneficial to patients. DGUOK. In a patient with spastic quadriplegia, seizures, and a normal MRI, the authors identified a homozygous mutation in DGUOK, the gene for mitochondrial DNA deletion syndrome type 3. In most cases, this mitochondrial DNA depletion syndrome presents with the full blown picture of mitochondrial disease including liver problems, elevated lactate, and hypoglycemia. The patient described by Srivastava and collaborators had a milder phenotype, which made the recognition of a mitochondrial disease difficult. Valproate was stopped subsequently to the molecular diagnosis. KCNB1. The authors identify a de novo missense mutation in KCNB1 in a patient with epileptic encephalopathy and refer to ongoing functional studies. This mutation is classified as pathogenic based on the authors’ analysis algorithms and provides a good example of how we struggle to classify mutations that were only found in a single patient so far. PANK2. In a patient with autism spectrum disorder, developmental regression, and spastic diplegia starting at the age of 4, the authors identified a homozygous missense mutation in PANK2, the gene for pantothenate kinase-associated neurodegeneration (PKAN). The MRI in this patient was initially considered normal, and the typical “eye of the tiger” sign was initially absent. In retrospect, the patient’s phenotype was considered consistent with PKAN and the MRI might have been performed too early to capture the classical neurodegenerative signs. WDR45. The authors also identified a de novo mutation in WDR45 in a patient with intellectual disability, but no additional features. In addition to PANK2, WDR45 causes neurodegeneration with brain iron accumulation (NBIA), even though the phenotypic spectrum of WDR45 mutation carriers can vary widely. As discussed in a previous post, the movement disorder that usually accompanies NBIA may have a relatively late onset, and WDR45-related NBIA may initially present with developmental delay only. Impact on management. Srivastava and collaborators claim that WES changed management of all 32 patients with positive results. While this seems to be an impressive number at first glance, it is important to define what is included under the blanket concept of “altered patient management“, as the authors also included indirect changes to patient management such as changes of reproductive planning or changes in the presumed disease inheritance pattern. However, there were also treatment changes that were directly tangible to patients including alterations in the patients’ medication in 6/32 patients with positive results, accounting for ~10% of all patients initially included in the study. Therefore, the study by Srivastava and collaborators adheres nicely to the empirical 30-10 rule of exome sequencing – in around ~30% of patients a diagnosis is found through WES, and in roughly 10% of patients, this diagnosis significantly alters patient management. Again, we need to be careful about how we define changes in patient management and how we define and monitor these interventions. This entry was posted in Guidance, Ideas. Bookmark the permalink.